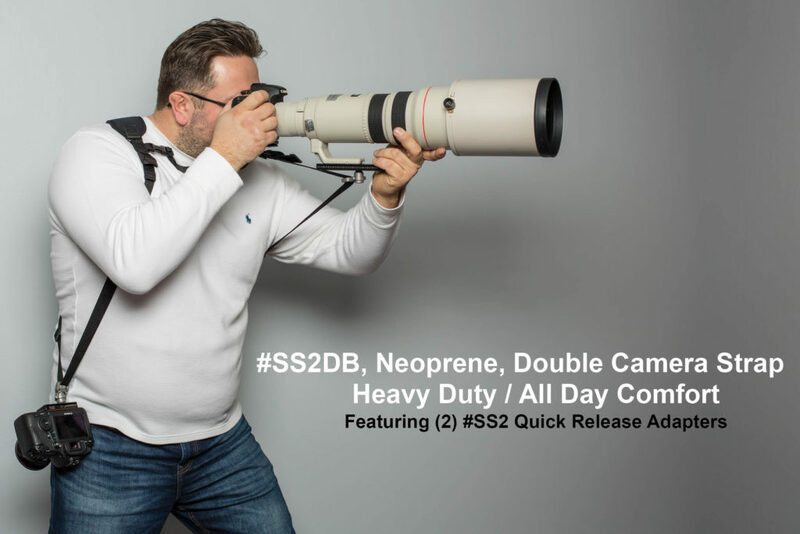 Designed for photographers who frequently shoot with at least two cameras, the new SS2DB Double Shoulder Sling Camera Strap by ProMediaGear features a strong and comfortable neoprene make and the tried and tested industrial strength #SS2P1 Quick Release Locking System. The two adapters are compatible with Arca-Swiss plates without the need for any screws or other adapters that may loosen during photo shoots. The #SS2P1 adapters can be attached and detached by simply depressing the button on top of the mechanism. The new dual shoulder strap is also compatible with Hybrid Manfrotto RC2 and additional ProMediaGear Compatible Bracket Plates. Orland Park, IL: ProMediaGear introduces, #SS2DB, Double Quick Release Strap featuring (2) #SS2P1 Quick Release Adapters. Neoprene, Dual Camera Shoulder Strap featuring the proven, industrial strength, #SS2P1 locking system that allows the strap to be installed and quickly removed without additional pieces attached to the camera or plate. Our strong and comfortable custom neoprene strap by Op/Tech with 1 inch nylon webbing offers all day comfort. The strap is paired up with (2) PMG #SS2P1 Quick Release Adapters that engage our compatible plates without any screws or adapters that may loosen during shooting. The #SS2P1 attaches and detaches by depressing the button on the top of the mechanism and quickly locks into the #PXM1 Manfrotto RC2 / Arca Compatible Mounting Plate or additional ProMediaGear Compatible Bracket Plates (sold separately). The #SS2 Quick Release Adapter System will work with virtually any camera and is part of the PMG Camera Support System (PMG CSS). Recommended Max Load: 15 lbs. ** (Above) #SS2DB attached to #PX6 Long Lens Balancing Plate and #PBX3 Universal Bracket Plate. ** (Below) SS2DB-PXM1 Additional Plates Available, Sold Separately.